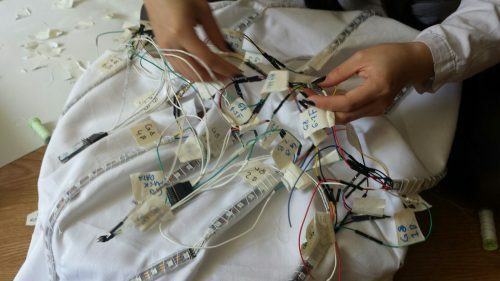 In collaboration with Professor Frank Kelly and the environmental scientists of King’s College London, artist Kasia Molga has created Human Sensor – a collection of hi-tech costumes that react to air pollution within the wearer’s environment. 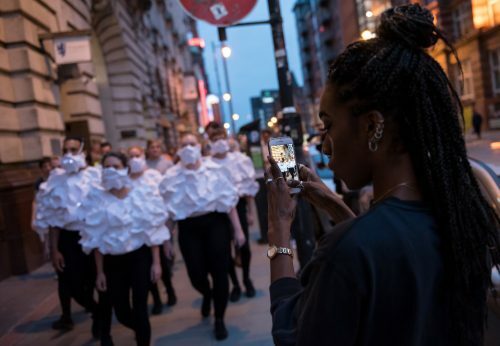 Commissioned by Invisible Dust, an organisation supporting artists and scientists to create pieces that explore environmental and climate change, Molga took to the streets of Manchester with her army of Human Sensors to promote the invisible threat of air pollution in the industrial city. Each suit is equipped with a small aerosol monitor that links to a Raspberry Pi and GPS watch. These components work together to collect pollution data from their location. Eventually, the suits will relay data back in real time to a publicly accessible website; for now, information is stored and submitted at a later date. The Pi also works to control the LEDs within the suit, causing them to flash, pulse, and produce patterns and colours that morph in reaction to air conditions as they are read by the monitor. The suit’s LED system responds to the presence of pollutant particles in the air, changing the colour of the white suit to reflect the positive or negative effect of the air around it. Walk past the grassy clearing of a local park, and the suit will turn green to match it. Stand behind the exhaust of a car, and you’ll find yourself pulsating red. It’s unsurprising that the presence of the suits in Manchester was both well received and a shock to the system for the city’s residents. While articles are beginning to surface regarding the impact of air pollution on children’s mental health, and other aspects of the detrimental health effects of pollution have long been known, it’s a constant struggle for scientists to remind society of the importance of this invisible threat. By building a physical reminder, using the simple warning colour system of red and green, it’s hard not to take the threat seriously. 23-29 July 2016 in Manchester Performers in hi tech illuminated costumes reveal changes in urban air pollution. Catch the extraordinary performances created by media artist Kasia Molga with Professor Frank Kelly from King’s College London. The hi-tech illuminated costumes reflect the air pollution you are breathing on your daily commute. Human Sensor is supported by the Wellcome Trust’s Sustaining Excellence Award and by Arts Council England; Invisible Dust is working in partnership with Manchester, European City of Science. Very cool and good for any city with severe pollution. Anyone know the aerosol monitor they’re using? I’d love to set up a display using an LCD.